Freshmen orientation is widely known for move-in days, campus procedure seminars and new student meet and greets. For Belmont University freshmen and transfers, the days leading up to the first day of school are marked with these events and more, including the chance to experience Nashville in a meaningful and hands-on way – through service. 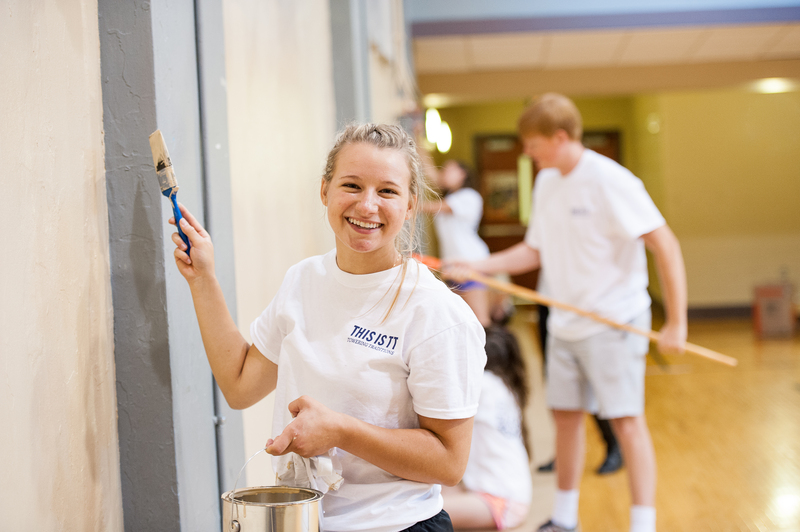 SERVE, an event that’s been held for more than 10 years, allows members of Belmont’s newest class and transfer students to spend time in the community with their orientation groups. This year, the 1,800 students were spread out among 41 sites including Buena Vista Enhanced Options Middle School, Preston Willis Ministries and Rocketown. With service being a significant guiding principle of the University’s Vision 2020 plan, President Dr. Bob Fisher commented on the natural fit of including a service project in students’ first days on campus, telling the student volunteers, “I hope many of you will remember the very first time you came to this campus, and you’ll be reminded that at Belmont, it’s about who you can serve. The greatest privilege you’ll ever have is to be in a position where you’re strong enough, smart enough and have the resources and the education so you can help someone. I’m so grateful that this is a place where we start and say from the beginning – you will go out and serve the community,” Dr. Fisher said.